I think my family could be on Hoarders: Holiday Candy edition. We’ve left the pumpkin behind and our latest obsession is peppermint. However, peppermint is tricky. 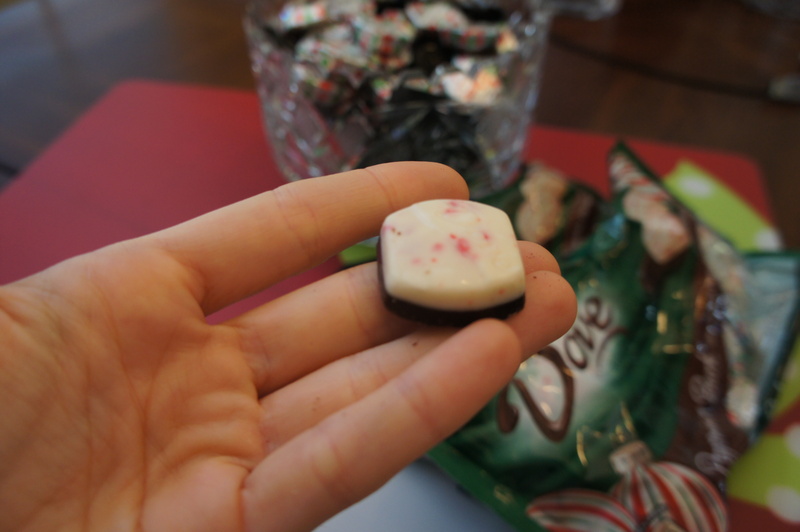 It can’t be too minty and the peppermint chunks can’t be too crunchy. 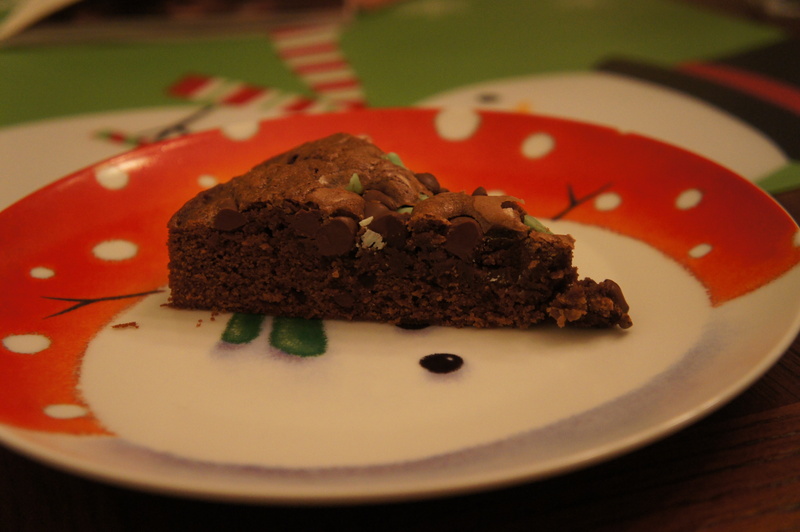 Enter, Dove Peppermint Bark. Oh my god. These are dangerous. When I’m heading out the door for work, I usually grab about 3. I can’t wait until a coworker empties my trash and notices it’s 60% candy wrapper foil. And of course, I’m terrified of December 26th, hence the excessive bags in the background of that picture. 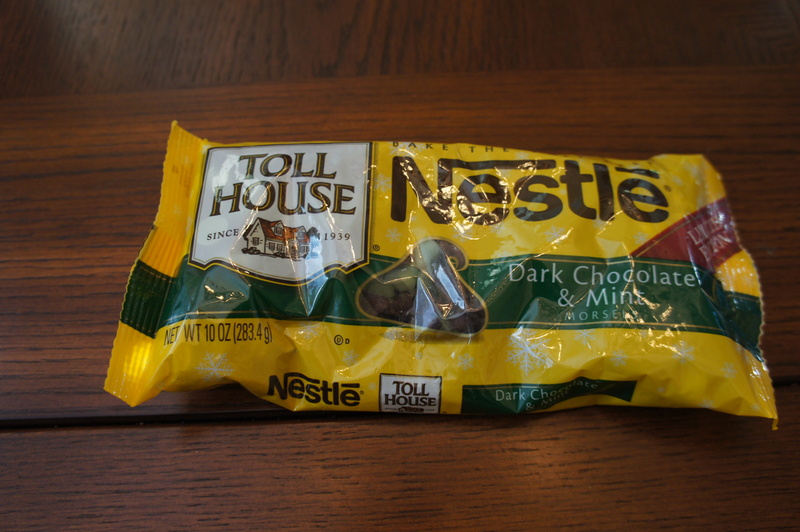 Another amazing find my parents introduced me to: Nestle Dark Chocolate & Mint Morsels. They baked the cookies listed on the back of the package last weekend and let’s just say they were heavenly and I devoured them. Afterwards my dad proceeded to bake the second recipe on the back. 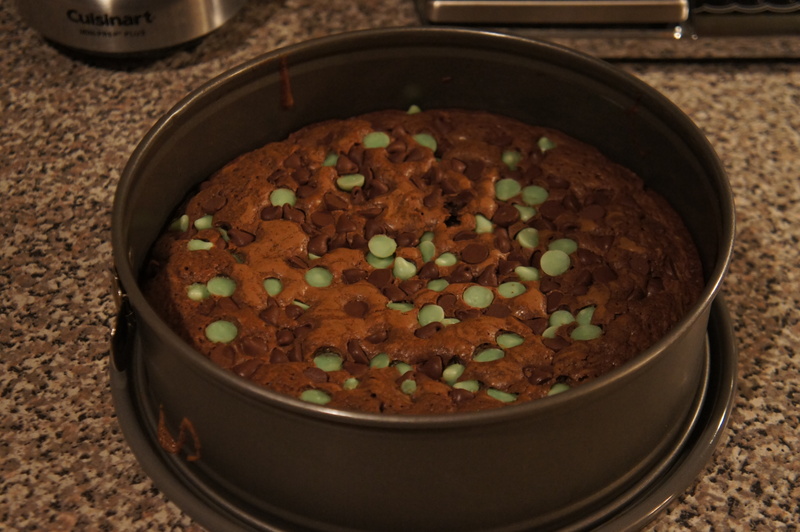 Thankfully, I was able to capture the unveiling– perfectly minty, chocolatey, and moist. 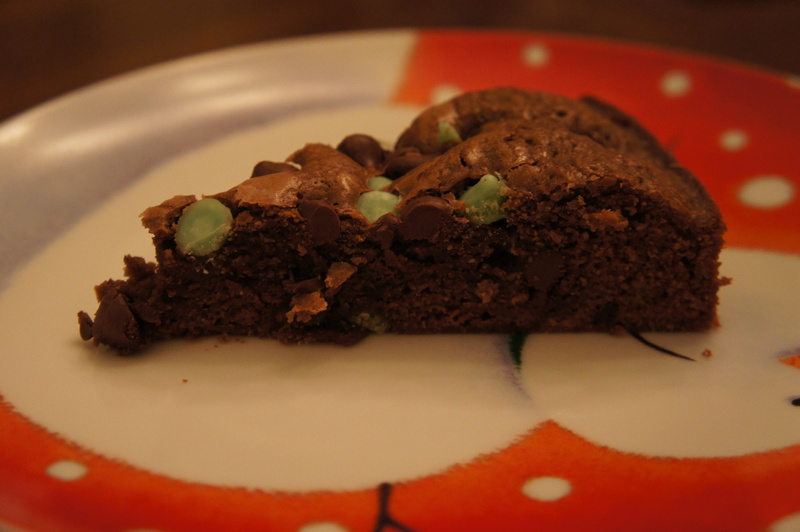 It’s like a brownie, meets a cookie, meets a cake. Preheat oven to 325 degrees. Grease 9-inch springform pan. Combine flour, cocoa, baking soda, and salt in small bowl. Combine sugar, butter, and water in medium saucepan. Warm over medium heat, stirring constantly, just until butter is melted; do not boil. Remove from heat. Add 3/4 cup morsels and vanilla extract. Stir in flour mixture. Stir in 1/2 cup morsels. Spread into prepared pan. Sprinkle with remaining morsels. Bake for 25 to 28 minutes or until wooden pick inserted in center comes out slightly sticky. Cool in pan on wire rack. Remove side of pan. Cut into wedges. I can’t even stress how much you have hit home on this recipe, I am speechless from cramming these wonderful goodies into my mouth! !